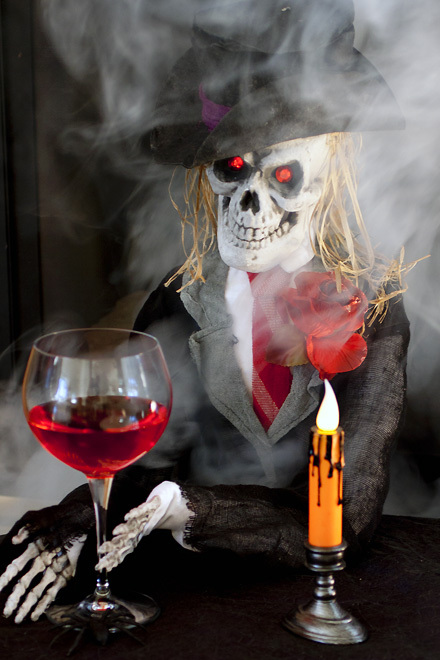 It wouldn’t be right to celebrate Halloween without some kind of festive vat of red punch. Even Bones, our creepy skeleton night watch seems to approve. For a family friendly Halloween fruit punch just leave the spirits out. Or for a mixed crowd, add 1-ounce of clear rum or vodka to individual 1-cup servings. Michaels sells Halloween shades of drink food coloring by Wilton that will make your punch more blood red than normal food dye. Print Recipe. Combine everything together in a very large punch bowl or two. Stir to combine and chill until ready to use. Makes about seventeen 8-ounce servings. This punch is totally Joanne-approved! I love that there's some tartness there to go along with the sweet. Ha! I love this. Your picture is hilarious! I'm thinking about throwing a Halloween party- this is a must have!